So delicious with it’s salty and sweet flavor combination, this pizza is crazy easy! It’s perfect for an appetizer or a light lunch or dinner, would be great for a brunch too! 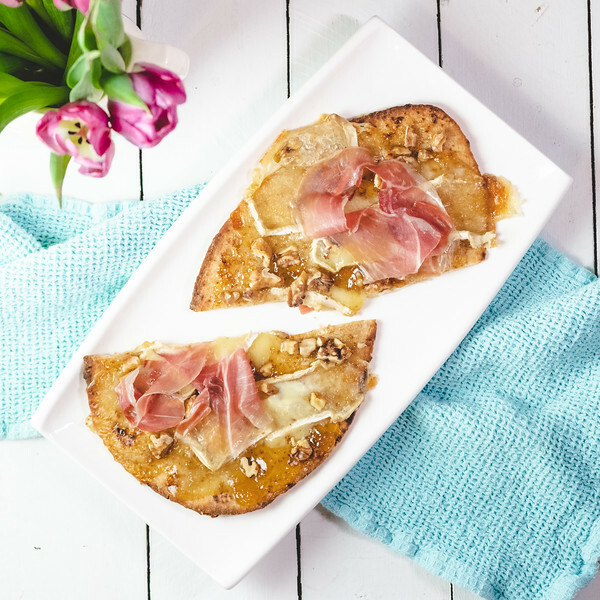 Naan bread, fig preserves, brie, walnuts and prosciutto are all you need to make this tasty pizza! 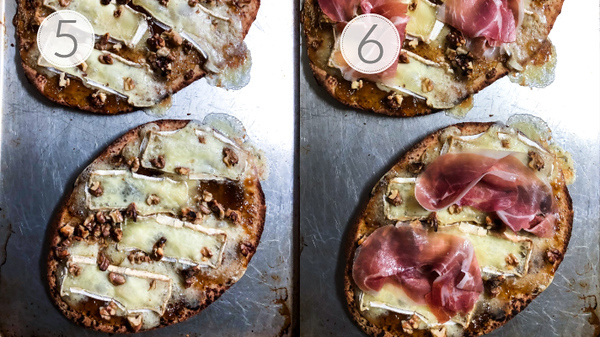 Click here to pin this Fig, Brie and Walnut Pizza now! This has got to be the easiest pizza recipe ever! Using naan bread is one of my favorite ways to get a quick and easy pizza on the table – like with this Barbecue Chicken Pizza. This recipe is even easier than that one! With only 5 ingredients and your only prep work is slicing the brie and preheating the oven! You’ve probably had an appetizer of baked brie with figs. This takes that idea and turns it into an easy pizza. It makes a great light lunch or dinner and would be perfect as an appetizer or for a brunch – I think it would be lovely for Mother’s Day or Valentine’s Day! With only 5 ingredients, you’re going to love how easy this pizza is to put together. Also, most of the ingredients are things you might already have in your pantry or fridge. Naan Bread – I used a whole wheat version. Can use pita bread. 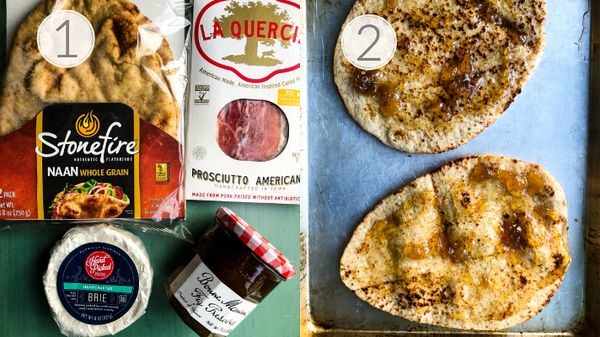 Step 1 – Preheat the oven to 450 and gather the ingredients: naan bread, fig preserves, walnuts and prosciutto. Step 2 – spread the fig preserves on the naan bread. Step 3 – thinly slice the brie and place it on the bread. Step 4 – scatter the chopped walnuts on top. Step 5 – bake for 8-10 minutes. Step 6 – remove from oven and top with thinly sliced prosciutto. Note: I had leftovers on the second day and did a quick run under the broiler. The prosciutto became crispy almost bacon-like. If you want your prosciutto crispy, add it during the last 5 minutes of baking or run the finished pizzas under the broiler. This was so good and so easy. Since it’s made with naan bread, you don’t even have to worry about making dough. You can have this on the table in about 20 minutes, really. The sweetness of the jam with the brie and the walnuts is fantastic. Then the prosciutto adds salty richness to it all. The only thing I want to change about the recipe (which I found at Three Many Cooks) is that they say the prosciutto is optional and I guess it is, except unless you don’t like it, I think it really is an important part of the pizza. Using naan bread and jar of fig preserves gives you a super easy and elegant pizza that you are going to love! Spread each naan bread with 3 tablespoons of the fig jam. 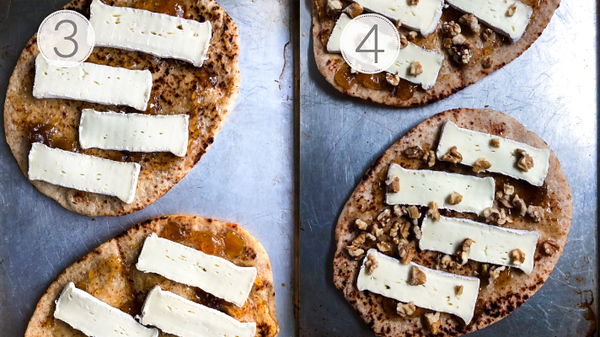 Evenly divide the cheese between the 4 breads and top each with about 2 tablespoons of the walnuts. Place on a baking sheet and bake for about 8-10 minutes or until cheese melts. Can substitute pita bread for the naan bread. This recipe was originally published in 2015 and updated for 2019. Fig and cheese are a match made in heaven so why not put it on a pizza! I love this idea! I think even my kids would eat this one! Oh, I bet they would love it! Such a delicious blend of flavors and textures. I love the use of the jam. Great idea! Love! What a delicious combination. Having just come back from Italy I love pizzas that just have a few really good ingredients and are not loaded with stuff. So in love with this sweet and salty flavor combination! Gotta happen for our next pizza night! I love those step by step photos – so easy! This flavor combo is amazing and the fig just sends it over the top! This was absolutely delicious! 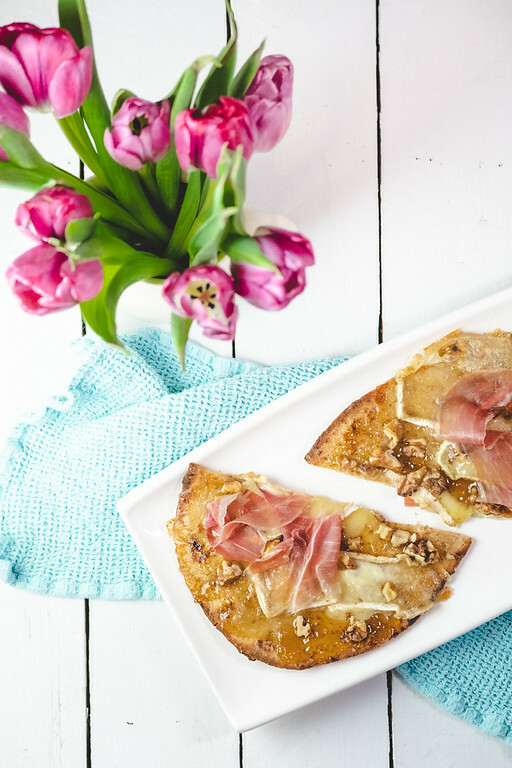 love the combo of brie with fig and the salty prosciutto! Love the fact that this pizza is made with naan bread, so easy! I have a margherita pizza made from naan on my blog 🙂 Yummy! You have just convinced me to give up my normal veggie with jalapenos! Thanks for a great recipe! I am trying to come up with a way that I could make this right now, even though I just ate. Looks great! First of all… this is my kind of pizza. I love fig and cheese. Second – the fridge thing. Totally there. I am totally making the kids get me ingredients out of the fridge because if I open that door I am going to be slapped in the face with the knowledge that some of the stuff in there is older than my youngest child… who is 11. AND just to make you feel better… when my mom died in 2002 I sold her house and in the process cleaned out her freezer. There was strawberry freezer jam in there that she and I had put up in 1983. True story. Feel better now? Haha, this happens a lot to me as well. As a matter of fact, right now there is no room in my tiny fridge for much because of all the half-empty jars: 3 types of mustard, marinated mushrooms, olives, red pepper spread, strawberry-rhubarb preserve. This pizza looks great! I have never used naan either, but I use pita or flatbread often. HAVE MERCY. That is all. So many thanks for popping by Snickerdoodle Sunday with your latest make…hope to see you again this weekend! This is a wonderful Pizza that we would love! Thanks so much for sharing with Full Plate Thursday and come back soon! Yesssss here too with finding expired stuff in the fridge yuck! Wish I had yummy gourmet things like these lurking about instead of ketchup and salad dressing. Looks like a delicious combination! In a restaurant, I had a sandwiches that was similar to this and loved it. Looks yummy! This looks simply delish! What a great combination of flavors! Thanks so much for joining us at the #HomeMattersParty – we hope to see you again next week! I love concocting different toppings..So pretty too.. I need to start scanning my fridge more frequently because I definitely have things expire frequently and it is just sad! I am all over anything with figs…love the sweet and salty and BRIE here! I confess I’ve also bought stuff at Marshall’s/TJ Maxx and then later wondered what to do with the rest of it! I decided to stick with spices/salt so that they’d clutter up my pantry instead of the door of my fridge. The fridge yields some of the best pizzas, though, just grabbing a bit of this and a bit of that and tossing it on–I can imagine that the taste of this was terrific. I’m one of those weirdos that is unfazed by pizza dough but freaked out by pie crust, so I’ve never tried naan as a base, but wow what a combo. Also, I’m ridiculously envious of your photos. My pizza photos NEVER look so good! Your talent for photography extends from portraits of people to portraits of pizza. I suppose the pizza doesn’t blink . . .